Any mention of "locust hordes" and "cannibalism" get our juices building, even if there aren't really any policy implications involved. Researchers from Princeton, Oxford and the University of Sydney think they know what drives locust plagues forward, a question that has vexed people at least since Pharaoh would not let the Israelites go. If you&apos;ve neglected the Old Testament, missed depictions from the American West of vast bands of locusts devouring the holdings of plucky homesteaders, or forgotten Doris Lessing&apos;s short tale of locusts on the veldt, know that monstrous swarms of the bugs — some estimated at hundreds of square miles — have throughout history burst out and munched their way through agrarian landscapes, sowing hunger and devastation in their wake. Presumably, hunger makes them get up and go. But according to the academics, it&apos;s not hunger per se that drives an individual locust, but the fear that a hungry locust to the rear might take a bite out of a neighboring locust that sets the bands in motion. "Cannibalism is rife within marching bands of locusts," a release from Princeton quotes professor Iain Couzin. "No one knew until now that cannibalistic interactions are directly responsible for the collective motion exhibited by these bands." As the release framed it: "Young locusts are pressed to eat others when the food supply necessary for supporting the population starts to dwindle. Starved for essential nutrients such as protein and salt, young locust ‘nymphs&apos; will nip at each other. Those under siege react by running from the aggressors. Others get jittery and simply seek to put space between them and any locust approaching from behind. That&apos;s how one aggressive interaction can lead to another and collectively start a vast migration," Couzin said. "And the activity intensifies, as the biting and ominous approach of others increases both the propensity to move and the forward momentum of individual locusts." With locust infestations contributing to the agonies in Darfur and Niger, understanding this has value in learning how to control the critters. Plus, there might be spinoffs in understanding how the actions of individuals, whether locusts or festival-goers, create group dynamics. If you actually get up and go to church (or synagogue or mosque), the odds are you’re less likely to cheat on your spouse. 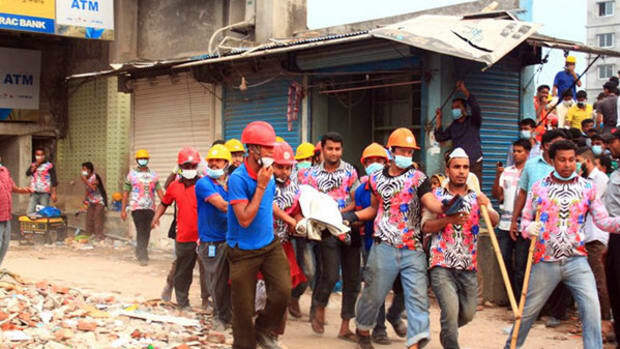 The garment industry finds that oversight of its far-off contractors is back in fashion. How tightly the industry wants to regulate itself is a matter of style.